In recent years, simulation has been used to investigate the mutual relationship between buildings and their occupants while focusing on pedestrian movement, emergency egress, day-to-day occupancy, and energy use. Most of these efforts employ discrete-time simulation, where building and agent properties are constantly updated at fixed time steps to reflect the dynamics of people and buildings. The behavior of real-world occupants, however, involves a variety of decision-making patterns that unfold over different time scales and are often triggered by discrete events rather than gradual change. 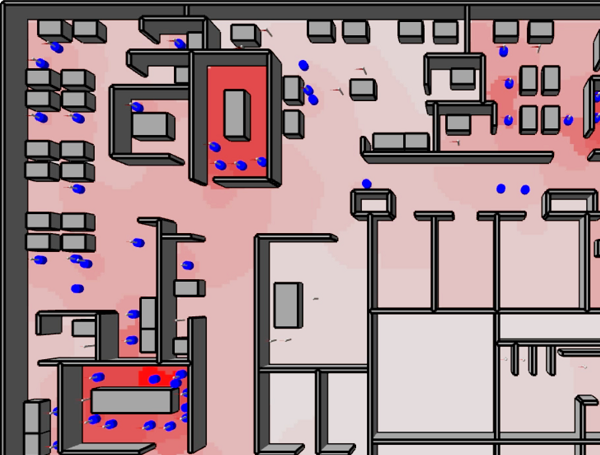 In working toward a platform supporting the full range of human activities in buildings, we embed a discrete-time occupant movement simulator called SteerSuite within a general-purpose discrete-event simulation framework called SyDEVS. With preexisting SteerSuite functions providing low-level steering behavior, and newly implemented SyDEVS nodes providing high-level planning behavior, the integrated prototype represents a multi-level and multi-paradigm approach to occupant simulation for building design applications.